HOW DOES THE EYELASH GROWER WORK? Over the course of the treatment with the eyelash grower, all your eyelashes will become fuller, longer, thicker and darker. The active ingredient in the eyelash grower is called bimatoprost. While the exact mechanism is unknown, it appears that this active ingredient can strengthen your eyelashes, increase the life cycle of each eyelash, and darken their colour. HOW QUICKLY WILL I SEE GROWTH RESULTS? You may begin to notice improvements in the first couple of weeks. Your lashes will continue to become fuller, longer and darker every week. If applied daily, the full results will be visible after 16 weeks. HOW IS THE EYELASH GROWER APPLIED? The eyelash grower is a clear liquid that you can simply apply on the margin of your upper eyelid once a day. It really couldn’t be any easier. You certainly can, but you probably won’t need to! Your natural lashes will be fuller, darker, and beautiful after each application. 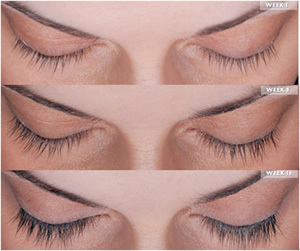 However, for those special occasions, mascara can certainly be used to further enhance your lush eyelashes. It’s like having the perfect canvas to paint on. CAN MEN USE THE EYELASH GROWER? Men like to be attractive too, and there’s nothing more eye catching than beautiful eyes. The eyelash growth will not make your eyelashes curl or look un-masculine, it will just make them more prominent and noticeable. And no one will ever know you use it, unless you tell them. Bimatoprost is a prescription product, and requires a consultation with our physician. At Medi-Sculpt, Dr. Reddy will review your medical history and determine if Bimatoprost is the right treatment for you. Expect to pay R1000 per bottle.